Maybe you're a citizen of the UK who's moved abroad and you miss keeping up with your favorite television shows-or maybe you're just an American who is curious what TV in another country is like. Whatever the reason, if you've ever tried to go to a streaming TV website such as iPlayer, iTV, Hulu or Netflix and you're in a different country, you're greeted with a message telling you that due to restrictions they can't let you watch anything. Bummer! How does it know that? What's happening is that the website looks at your public IP address and uses it to determine your location. If you're wondering what your public IP address is, you can go to whatismyip.com and it will tell you. The solution to this problem is to use what is called a proxy server. A proxy server is a separate computer that acts as intermediary between you and whatever resources you're trying to access. You send a request to the proxy server and then the proxy server processes the request on your behalf. Proxy servers are primarily used in the corporate environment to filter network traffic, but to solve our problem we are relying on one characteristic of its use that might not have occurred to you yet. The resource (in this case a website) only sees the public IP address of the computer making the request: the IP of the proxy server, not yours. So now imagine if you were in America and connected to a proxy server located in the UK. What would happen? It would look like you were in the UK! 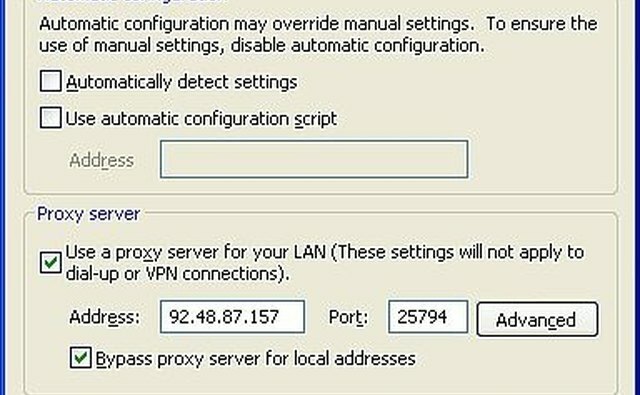 In this article I will provide the steps for how to find a proxy server service and configure your computer to use it. Find a proxy server service to use. If you've searched for one before you've likely come across a number of "Free" proxy server sites. Some of the servers on these sites do work to a small degree for browsing web pages, but for actually trying to stream media I have yet to find one that will work. The best solution is to use a paid proxy service. For this example I am using XROXY.com. XROXY has a lot of things going for it. They have a free 3-day trial, they're cheap, they fully understand that you want to use their service to stream media for good performance, and they use PayPal, so you don't have to worry about giving some stranger on the other side of the planet your credit card information. 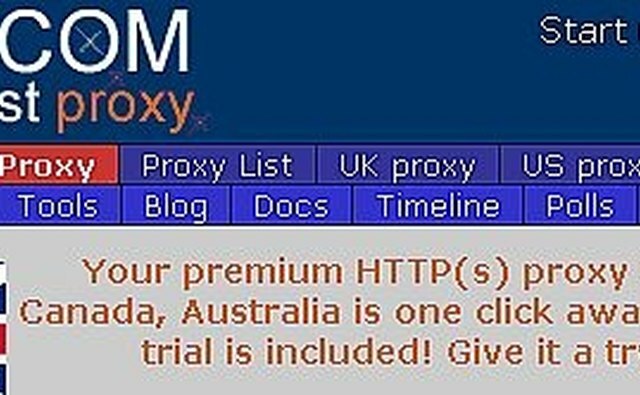 On the XROXY website, choose "Premium Proxy." Select the flag of the country you want your proxy server to be located in by clicking the radio button next to the flag. Choose your "Subscription Period," and "Subscription Recurrence." Then enter your email address and hit "Subscribe." Be sure the country you are choosing is the country that hosts the websites you are wanting to access. Don't use a fake email address, or else they can't send you your proxy server address. This will take you to PayPal where you will check out. At the end of the checkout it will give you a username and password for the proxy. *Note: Be sure to write the password down because it will not be emailed to you. If you want to end your subscription before your trial runs out, go to your PayPal account to cancel the subscription. There is no option at the XROXY site to cancel. Check your email. You should get a message with your proxy server's address, port number, username and subscription ID. Your password was given to you during the PayPal checkout. You did write it down, right? Set Up Firefox I'm starting with Firefox because it is the easiest to configure to use a proxy. The instructions are virtually identical for both PC and Mac. On a PC in Firefox, go to Tools > Options > Network > Settings. For a Mac in Firefox, go to Firefox > Preferences > Network > Settings. Click "Manual proxy configuration" and enter the IP address of your proxy server in the "HTTP Proxy" field and the port in the "Port" field. Check the box that says "Use this proxy server for all protocols." Click OK. Now, the next time you try to connect to a web page it will ask you for the proxy server username and password. Enter in the credentials XROXY gave you and you're done. To later disconnect from the proxy just come back to Network Settings and click "No Proxy." Set Up Internet Explorer Go to Tools > Internet Options > Connections > LAN Settings to set up a proxy server in Internet Explorer. Make sure both boxes for Automatic Configuration are unchecked. Check "Use a proxy server for your LAN." Enter the proxy server IP and port into the appropriate fields. Check "Bypass proxy server for local addresses." Click "Advanced." Check "Use the same proxy server for all protocols." Hit "OK" on all the windows. The next time you time you try to connect to a web page it will ask you for the proxy server username and password. Enter in the credentials XROXY gave you. 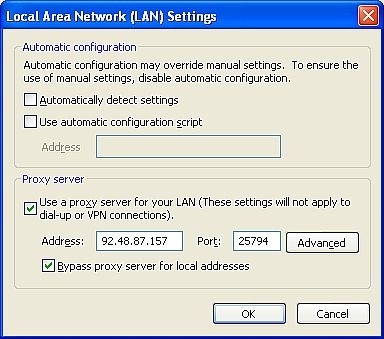 To later disconnect from the proxy just come back to LAN Settings and uncheck "Use a proxy server for your LAN." Set Up Safari on a Mac To set up a proxy server for a Mac to use with Safari we have to go into System Preferences. Go to Apple > System Preferences > Choose your network connection (Airport or Built In Ethernet) > Click Configure (or Advanced for Leopard) > Proxies. For Leopard there is one more step; change Configure Proxies to "Manually." 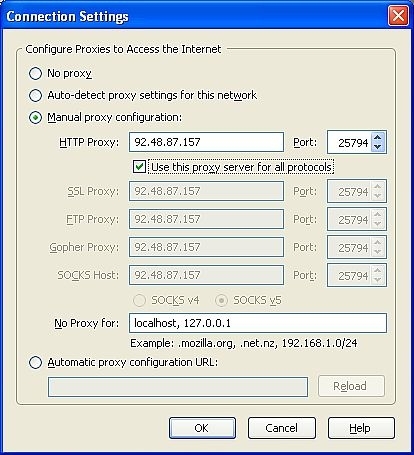 Choose "Web Proxy (HTTP)" and enter the proxy server IP address and port. Check "Proxy server requires password" and enter the credentials XPROXY gave you. When you're done click Apply and then choose "Secure Web Proxy (HTTPS)" and repeat the process. To undo the Proxy Server connection you will have to come all the way back here and uncheck Web Proxy and Secure Web Proxy. 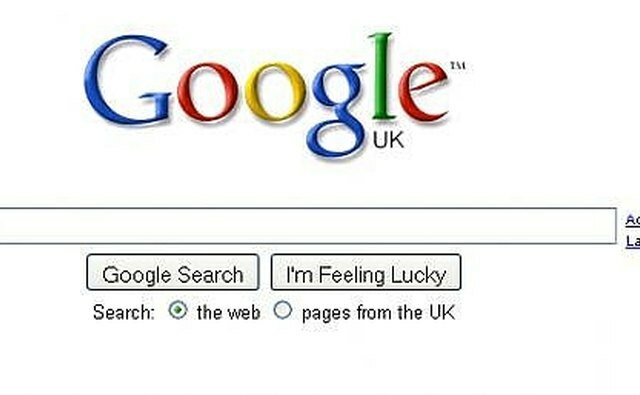 Test out your configuration by going to Google.com and see if your browser thinks you are in a different country. For example, if I have a UK Proxy Server, when I enter google.com into my browser it will automatically route me to google.co.uk instead. Now you are ready to go watch some foreign online streaming television. If you have a UK proxy, BBC iPlayer and iTV are favorites. If your are outside the United States and are using a U.S. Proxy, check out Hulu, Netflix, AOL television and more! Be sure to check out some of my other eHow articles for more cool stuff you can do with your PC, Mac or iPhone.